Cook pasta according to package directions, adding the sugar snap peas for the last 1 minute of cooking. Drain well. Rinse well with cold water; drain again. In a large bowl, combine pasta mixture, sweet pepper, basil, and olives. Set aside. For dressing, in a screw-top jar, combine red wine vinegar, olive oil, garlic, salt, and pepper. Cover and shake well. Pour dressing over pasta and vegetables; toss gently to combine. Makes 6 (1/2-cup) servings. Chef Tip: You can use assorted sweet peppers for color and flavor. Be sure to remove all seeds and the inside "rib" before you dice. You can also grill the peppers, if you'd like a more "smoky" flavor. Chef Tip: You can use an assortment of olives or one in particular. Make sure they are pitted. 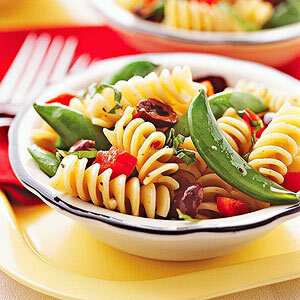 Again, use the best olives that are available to complement your salad. *Chef Tip: A quick way to shred (chiffonade) fresh basil is to stack several leaves on top of each other and roll the leaves up like a cigar. Starting at one end, use a sharp knife to cut crosswise into slices.